DWL027 / IOR015-5 . Released 2002 . 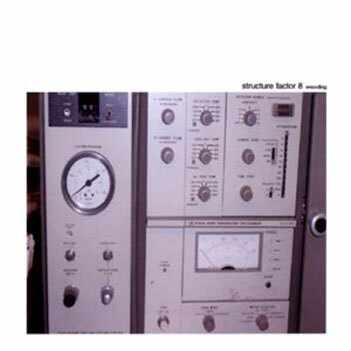 Out of Print Description Final LP from Structure Factor 8 - released on Ionik, distributed by Datawaslost. Reviews If you've been wondering what was going to be next for Structure Factor 8, here's your answer. SF8 have been a major staple on the Ionik label and the Cincinnati indie scene for quite a while now; this album is, in fact, their fifth release since their lo-fi startings in 1998. Historically, this would be the time for a band to try something really experimental that usually results in failure. Thankfully, SF8 don't even toy with the idea, favouring instead to release more of the same lo-fi indie pop. And, sure, they've done it before - but it's still just as enjoyable as it ever was. "A Green Thought", for example, is a fun, upbeat number that rolls along, kind of like a conveyor belt force-feeding you pop hook after pop hook... if you aren't humming its melody the day after, then you might want to make sure your brain hasn't been replaced with a that of a robot. The same can be said for "Demon Run" and "The Do Nothing Faculty", both of which are pleasant little pop numbers. If happy's not what you're seeking, though, there are a few more melancholy tracks, which are pleasant in a different way.